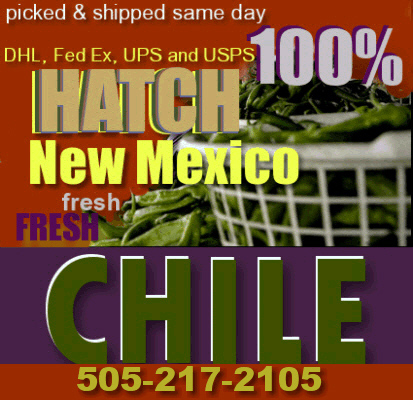 Hatch NM, Hatch New Mexico, Hatch Green Chile, New Mexico Chili, NM Chili, NM Chile, New Mexico Chile, Chile Gifts and more! Please note there are several items that are either seasonal or have time considerations attached, therefore delivery times may vary from our typical practices and products.... Orders may not be processed for up to 5 (business) days depending on volume at the time. FRESH chile orders are usually shipped from late August until mid October. We are not responsible for shipping company errors, accidents, or delays. If it's our responsibility such as shipping the wrong item, we will be responsible for replacement, but if it's lost by USPS, Fed Ex, or UPS, we do not accept the liability. Yes, we will work with you to exact what ever claim you make, but we are not accepting responsibility for their mistake/s. All orders are subject to availability. Click here for the Early Bird Special price on 2012 fresh chile or here for our NEWEST products!